A number of walkers tackling A Dales High Way have expressed the desire to take in all of the Yorkshire Three Peaks along the route - Pen-y-ghent, Ingleborough and Whernside. Indeed, a few have adjusted their route to do just that. The official Dales High Way route includes only one of the Three Peaks - Ingleborough - but offers Whernside in addition as an Option. However, Pen-y-ghent does not feature. It is possible, though, to include Pen-y-ghent in Section Three, which runs from Settle to Chapel-le-Dale, then add Whernside in Section Four to take in all Three Peaks. The suggested Pen-y-ghent - Three Peaks Alternative adds 4 miles to Section Three, with an additional 300 metres of ascent, taking around 2 hours extra. However, it also gives the opportunity to break the Section at Horton-in-Ribblesdale. The Pen-y-ghent - Three Peaks Alternative cuts from the main Dales High Way route at Stainforth Bridge, heading up through Stainforth to join the Ribble Way, climbing to Moor Head Lane and continuing north along the ridge, parallel to Long Lane, which it eventually joins above Dub Cote Scar, before dropping to Churn Milk Hole to join the Pennine Way. It now follows the Pennine Way up to the summit of Pen-y-ghent, then on to drop to Tarn Bar on Horton Moor and join the walled track down past Horton Scar to Horton-in-Ribblesdale. The Alternative now follows the Three Peaks Challenge route up past the railway station and onto Sulber, climbing west to rejoin the main Dales High Way just before the Shooting Hut by the Allotment. The main route then continues to the summit of Ingleborough, before dropping via Humphrey Bottom and Souther Scales to Chapel-le-Dale. There is, however, a downside to taking this alternative - you miss out on a particularly beautiful section of the route: the gentle climb past Smearset Scar, the delightful hamlet of Feizor with it's popular farm cafe, and the lovely, secluded valley of Crummackdale. 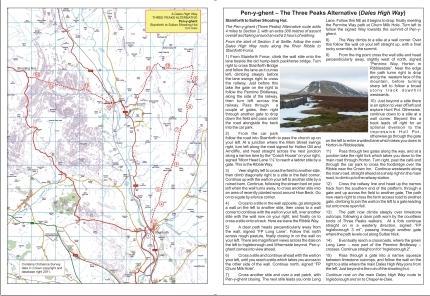 A map and route description of the Three Peaks Alternative can be downloaded here (PDF format).